Abstract: Singir mitera sejati and ngudi susila is a literary work that shaped nadhom with poetic following the rules of science arudl. In addition there is an aesthetic and educational value. Singir can serve as a medium of education and learning resources. Because singir store adhiluhung value which can be utilized as appropriate. Particularly in the study of literature in the school or boarding school. This research aims to describe the aesthetic and educational value. Substantially, this research describe about three things, namely (1) aesthetic value that includes, (a) the aesthetics of form, and (b) the aesthetic contents. (2) the value of moral education that includes (a) the value of moral education which clarifies the relationship of human with God, (b) the relationship of human with human, (c) man human with theirself and (d) the human with the environment or nature. Keyword: singir, aesthetics and education. RIZAL, Moh. Ahsan Sohifur. NILAI ESTETIK NILAI ESTETIKA DAN PENDIDIKAN NASKAH SINGIR MITERA SEJATI DAN NGUDI SUSILA KARYA KIAI BISRI MUSTHOFA. 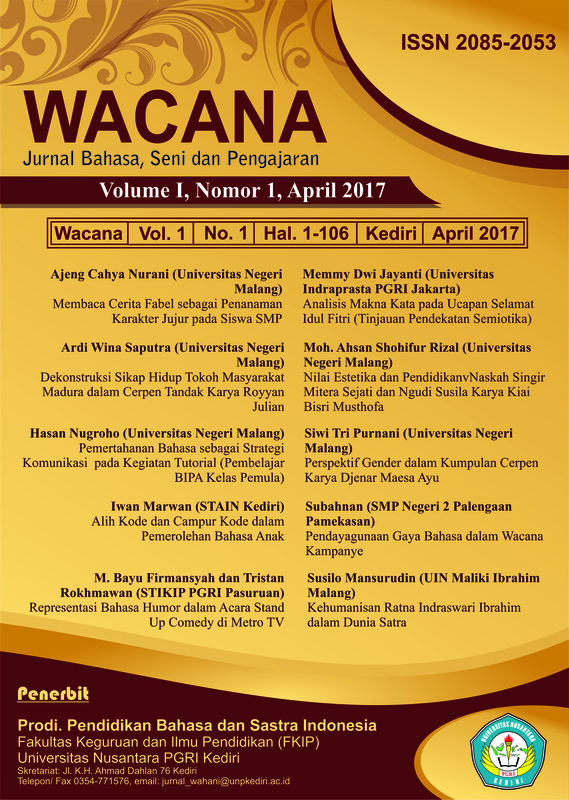 Wacana : Jurnal Bahasa, Seni, dan Pengajaran, [S.l. ], v. 1, n. 1, p. 54-71, apr. 2017. ISSN 2085-2053. Available at: <http://ojs.unpkediri.ac.id/index.php/bind/article/view/679>. Date accessed: 25 apr. 2019.